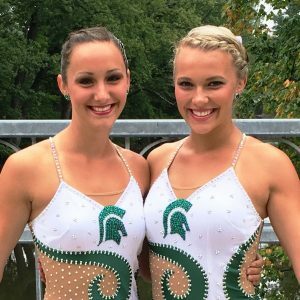 From a very young age, MSU Feature Twirler Taylor Scheffer, has always had a love for performing. 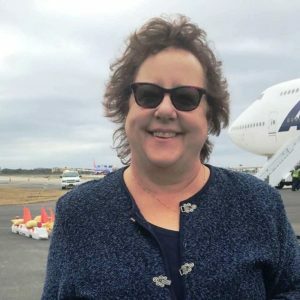 She says she remembers watching her best friend twirl on the playground in elementary school, who eventually taught her how to and ever since then, she’s been taking private lessons, taking classes, and competing all around the country, for nearly ten years. Twirling is a very unique, niche of a community that takes not only a high level of athleticism, but it also requires a background in dance and gymnastics. First starting as a gymnast, and eventually turning towards twirling, Taylor loves that in order to be a good twirler, you have to continuously perfect your skills and technique of gymnasts and dancers while twirling a baton. 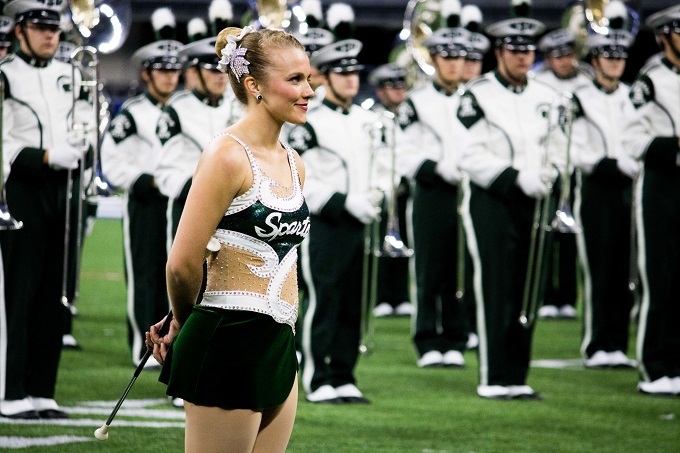 Being a twirler takes a balanced combination of dedication, perseverance, self-discipline, stamina, memory retention, and lots of hand eye coordination. 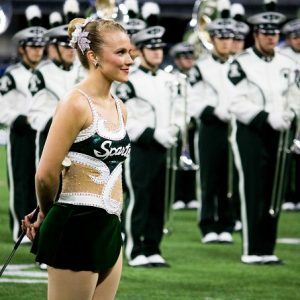 As a part of the small twirling community, Taylor says that she has been able to make friends from all over the country, and no matter who they are competing against, she’s always found it to be a supportive and welcoming environment. 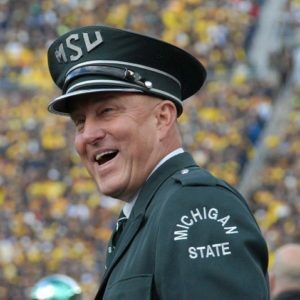 This supportive dynamic drew her to MSU. 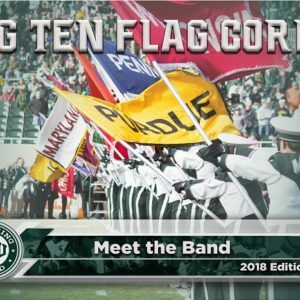 She remembers attending her first football game in Spartan Stadium and immediately fell in love with the professionalism and dedication of the Spartan Marching Band. 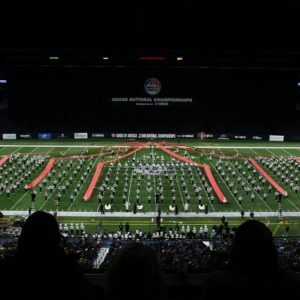 As one of the oldest and most widely recognized marching bands in the country, she knew she wanted to be a part of the strong traditions and high level of excellence that the SMB holds. 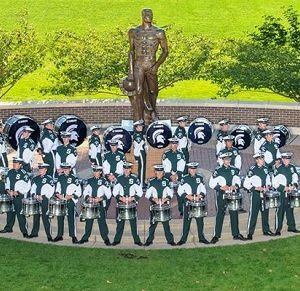 Just like the other members of the marching band, Taylor has to learn new shows, new routines, and practice each and every day to prepare for Gameday. Her rehearsal consists of stretching, practicing tricks, and incorporating her performance with the rest of the band. 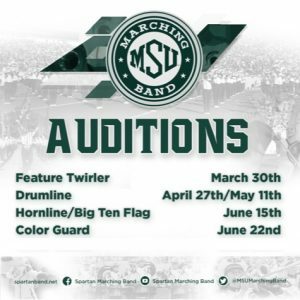 Twirling at the collegiate level takes a lot of time and dedication, and Taylor says that her best advice to anyone would be “to keep practicing and find tricks that make you as a twirler stand out during the audition process.” If you’re interested in being a Twirler for the Spartan Marching Band, they often look for candidates with high level twirling skills, good physical fitness, good showmanship, and the ability to entertain a stadium full of people. 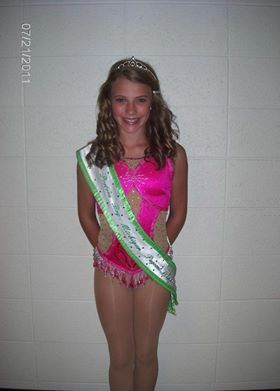 Taylor credits her success as a twirler to Twirl-M’s, located in Walled Lake, Michigan, as well as her coach Rhonda Muscaro. Taylor is a current Junior at MSU and is majoring in Kinesiology with the goal of attending PA school after graduation.